Alexandria Post-War Suburbs Historic District: The Historic District is listed on the National Register of Historic Places! 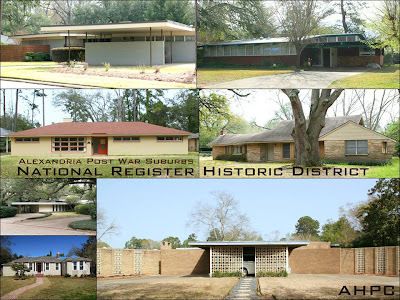 The Historic District is listed on the National Register of Historic Places! 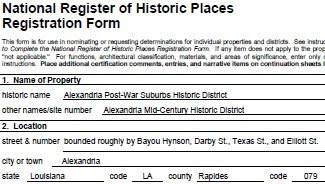 Today the Director of the National Park Service announced for the National Register of Historic Places that the Alexandria Post-War Suburbs Historic District was listed on June 6, 2013. Read the announcement. More information is available about the listing on National Register of Historic Places website. Let's celebrate Louisiana's first mid-century modern historic district! I grew up in Mattie O Ball neighborhood, in the tan house with the big oak tree in front of it in the pictures above. That is so awesome that the neighborhood received such an honorable distinction!